Wayne Allen | Daily Times Workers with the Shelly Company working to pave streets in Washington Township. Washington Township is undergoing its largest paving project ever. The project, which started earlier this week, will pave 32 areas within the township. Jerry Russell, chairman of the Washington Township Trustees said the project is being funded with levy funds. “This is the biggest paving project that Washington Township has ever done. (It costs) somewhere in the neighborhood of $399, 400,” Russell said. The levy has continued to be renewed by township voters. Russell said the Shelly Company was awarded the contract to do the work and has worked with the township over the years on various paving projects. Roads within the township to be included in the project are Stoney Run, Vaughters Run, Crull Street, Larkin Street, Hudson Street, Stockham Road, 2nd Street, 3rd Street, Alley of High Street, High Street, 5th Street, Hygean Extension, 9th Street. East Street, 10th Street, Kemper Land and Cityview, 13th Street, Old Nauvoo Parking Lot, Center Street, John Street. In Valleyview, Lincoln Street, Cooper Hill, Fairfax, Belmont, Center Street, Walnut Street. In Dry Run, Central Avenue, Wolf Run Road, Hardscrabble, Elza Lane, Lillian Lane and Carol Street. 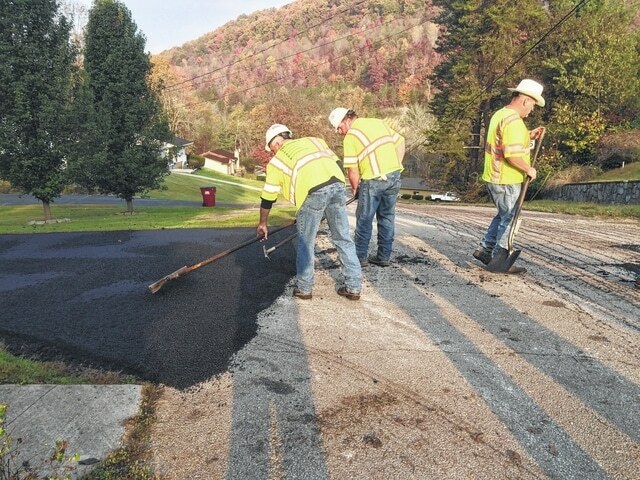 When asked about the work being done, Cary Schrader, foreman with Shelly Paving on the Washington Township Paving Project, said there are two crews working on the project, which started Thursday. It’s estimated the entire project will take a week and a half to complete, depending on weather.